Initially, the location around Mount Kaba is one of nature reserves for Rafflesia flower protection. However, now the condition of this tourist area began to be unreliable as the initial goal was made, ie for a protected park for some Sumatra flora. 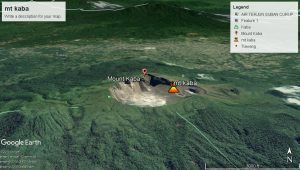 2000 ==> Since early June there has been an increase in volcanic activity at Mount Kaba, triggered by a 7.8-magnitude tectonic earthquake on Bengkulu on 4 June accompanied by aftershocks that can be felt in the area of Mount Kaba. The occurrence of volcanic earthquakes before the beginning of June averaged 1 incident each day, but after the beginning of June volcanic earthquakes increased to an average of 15 times each day. The disturbance of the tectonic earthquake of Bengkulu disrupts the fluid bag system in the body of Mount Kaba, as well as disrupting the existing fracture system, as well as triggering the occurrence of shallow volcanic earthquakes of 1-3 kilometers hypnotists. The mechanism of the source of the volcanic earthquake has a downward fault solution. The volcanic earthquake energy released gradually decreases after September. The seismic crisis this time is not followed by significant surface changes in the craters of Mount Kaba. The morphology of Mount Kaba is a ridge extending with irregular relief. The direction of the ridge relative to the north-east. The direction of this straightness is a trace of displacement of eruption points. There are at least 8 (eight) points of eruption that can be traced from the shape of the crater, the remains of crater / caldera wall and volcanic cones. The distance between the eruptions is close, so visually all of these morphological features can be well observed from the highest point in Bukit Kaba (1952 m.dpl). Mount Kaba is a volcano with a caldera structure. The eruption of Mount Kaba consists of lava flow and pyroclastic drift (fall and flow), which are the products of 3 (three) periods, namely: pre-caldera period, caldera formation period, and peak cone formation period. The pre-caldera product comes from the old volcano of Mount Malintang and Mount Kaba Tua. The top cone consists of Bukit Itam, Bukit Ranting, Padang Masyhar, and Bukit Kaba Besar. The oldest volcanic sediment is a pre-caldera product of Mount Malintang, while the youngest sediment is the product of the Great Kaba Mountain which consists of lava flows and pyroclastic fall (Figure II.2). The structure that develops on Mount Kaba and its surroundings consists of shear faults and caldera structures. The shear faults are part of the Sumatran Fault Zone, located in the southwest of Mount Kaba, locally named as the Musi-Snoring faults as it cuts the Musi River. This type of faults fault horizontal (dextral horizontal slip fault). The caldera structure is caused by collapse, which in turn grows eruptive centers.